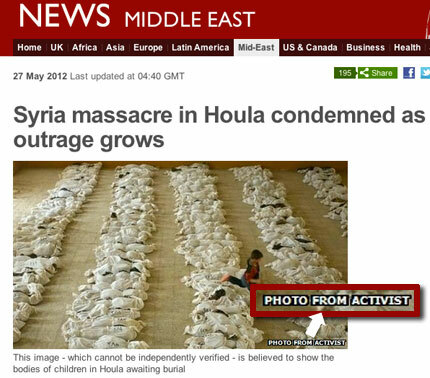 Fact-checking took a holiday at the BBC today, as a credit line of "photo from activist" was used to identify propaganda promoting the activist's cause, on the front page of the BBC's website for an article titled "Syria massacre in Houla condemned as outrage grows." The problem? Among the many, is that this photograph, purported to have been taken on or about Friday, May 25th, 2012 in Houla, Syria, and represented in the photo caption as "believed to show the bodies of children...", was actually taken on May 27, 2003, 9 years earlier, in Al Musayyib, Iraq, by photographer Marco Di Lauro, a photojournalist for Reportage by Getty Images. "An Iraqi child jumps over a line of hundreds of bodies, in a school where they have been transported from a mass grave, to be identified. They were discovered in the desert in the outskirts of Al Musayyib, 40 km south of Baghdad. It has been estimated that between 10,000 and 15,000 Iraqis had been reported missing in the region south of Baghdad. People have been searching for days for identity cards or other clues among the skeletons to try to find the remains of brothers, fathers, mothers, sisters and even children who disappeared when Saddam's government crushed a Shi'ite uprising following the 1991 Gulf War." Di Lauro, who is a freelance photographer represented by Reportage by Getty Images, also licenses this image on the Getty website here. It should not be the case that someone whom is identified as an "activist" should be given the credence of a journalist, and have their propaganda disseminated under that banner. A statement they make is (and must be) fact-checked, as should any visuals they provide. BBC Director of the World Service and Global News, Richard Sambrook, who wrote in Nieman Reports, from The Nieman Foundation for Journalism at Harvard, of "Citizen Journalism and the BBC" during his tenure at the BBC, wrote at the time (Winter, 2005) "...From now on, news coverage is a partnership." Sambrook notes, accurately, "How can our journalistic reputation be protected when we are not fully in control of our content?" Indeed, Mr. Sambrook. This "partnership" was violated by an activist with their own agenda. It must be said that Sambrook is not now at the helm of any BBC division, but he was a reporter for the BBC and left in 2010. Surely, Sambrook's imprint was left on those who came after his departure. Sambrook defends citizen journalists, with initiatives like the BBC Action Network's iCan, saying "As someone who supports this new direction, I don’t suggest the BBC staff abdicate their responsibility for accuracy, fairness or objectivity. There will always be a central place for editorial judgment to be applied. That judgment is the essential brand value of major news organizations. As we open up to contributions from the public, we must do so in a way that is consistent with our editorial values." At that same time, Sambrook authored another article for Nieman Reports, touting "The BBC’s College of Journalism" writing "The BBC is establishing a College of Journalism to raise and support editorial standards...the College of Journalism will also focus on ethics and values and building knowledge on key themes and issues, such as Europe and the Middle East...So far, 10,000 staffers have completed an online editorial policy course (the biggest BBC interactive training initiative yet), and 8,000 staff members have attended workshops on sources and attribution." It is clear that whomever edited the article must have missed that workshop on sources an attribution. In that same issue of Nieman Reports, Santiago Lyon, at the time (and still) Director of Photography for the Associated Press and Lou Ferrara, who was an online editor for the Associated Press, wrote in an article "With Citizens’ Visual News Coverage Standards Don’t Change" that "‘In an era in which digital alteration of images is increasingly easy, credibility is everything.’" In fact, as they note of an image they saw on a BBC website, they (the AP) went through the process of locating the citizen photographer, obtained rights, and then distributed the image. Lyon's team, no doubt, also vetted the veracity of the image during that process. Of the veracity of all citizen journalism content "The same journalistic standards that are currently applied to mainstream media sources will need to be applied to all citizen-produced material. Verification is crucial." This activist saw it fit to steal from a photographer. Di Lauro puts his life on the line to make a living and produce images that reveal to the world what is happening. He should be afforded the ability to continue to do so, and copyright, and rights to his images, gives him the ability to continue to tell the story. The caption attempts to offer an out, indicating "This image - which cannot be independently verified - is believed to show the bodies of children in Houla awaiting burial." According to the BBC, and other news sources, while there were at least 90 people killed, 32 were children under the age of 10. In 30 seconds, I was able to count about to 25 bodies in the row second from the left, and multiply that by 3 for the 3 center rows of the 5 depicted, and that's 75 estimating that there are also 25 on the two outer rows depicted and we're at 125. Clearly, there are way more than 32 bodies in this photograph, and there are even more than 90. Clearly, more questions needed to be asked of the source. An update of the story just before 8am GMT, did not list a correction, or editorial note about the mis-credited and mis-characterized photograph. The BBC simply made it as if it didn't exist and never did anything wrong. Di Lauro, and Getty Images have recourse for the theft of his intellectual property. While they of course have recourse with the activist, they also have recourse with the BBC as well. There have been many conversations about the "orphaning" of photographs, whereby someone strips the metadata and and other indications of image ownership from an image, and then uses that image for their own purposes and ends, and when the actual creator of the photograph is identified, they are unable to stop the uses of their image - whether in an accurate depiction of something, or, in this case, as propaganda completely disconnected from the reality in the image. While it is reasonable to assume that a news organization, presented with the evidence of falsehood, would remove a mis-representing image, commercial entities, or uses where the users don't care or are otherwise unsavory, may well keep the image up, under the misguided notion that the end justifies the means. While the efforts to make orphaned works legally allowable in the United States (a dubious at best consideration relative to signatories to the Berne Convention, which would likely apply in this UK use) went away a few years back, the effort continues to percolate with people who believe much of intellectual property should not be given any control by it's creators. I would hope that even those orphan works proponents would agree that the theft of intellectual property in this manner should not be allowed in whatever final form they hope for in their legislative efforts. In the end, it was because Di Lauro became aware of the theft of his image and the mis-characterization of it that the BBC no longer has it on their website. It was not because of the efforts of the editors of the BBC doing their due diligence. According to the screen grab the story was updated at 04:40 GMT, and the screen grab we have is timed at 12:26 GMT, so for at least 9 hours the BBC was profiting off of Di Lauro's image, and that is assuming that the photo was first posted during the 4:40am update, and taken down right after the screen shot was made. A screen shot a few hours later shows a video instead. How many other times has this happened? Whether it's a CNN iReporter, Fox News' uReport, being an MSNBC Citizen Journalist, or a part of the BBC's Action Network's iCan, Citizen Journalist representations must carry at least as high a burden of proof as that of professional journalists, if not higher. Interestingly enough, The BBC closed up their iCan experiment because, according to BBC News editor Peter Horrocks in this article "the level of involvement in it compared to the cost was inappropriate." As such, in April of 2008, just 5 years in, the grassroots effort wasn't working. While the iCan effort isn't exactly comparative to iReporters or uReporters, the notion of laying the responsibility on the public at large for engaging in reporting is fraught with pitfalls and risks. The BBC took a risk while their standards were on holiday, and that risky move failed them miserably. images for their own purposes also. propagandists had Germans bayoneting babies! This is an interesting post, but I think you need to expand your outrage. The whole idea of ethics in journalism is exploded in this instance of an agency stealing property and then using it as propaganda to tell their side of a story. In fact this points out that supposed "professional journalism" is free of bias and propagandizing, which is ridiculous. Citizen journalists have the same slant and bias as do 'editors' at organizations whose purpose is to sell a point of view under the guise of objectivity. As a photographer, I am concerned about theft like you have pointed out here. As a news consumer, I am concerned about the blatant lying to the reading public, with the intent to imbue an editorial stance embedded within news. That the BBC tried to engage the public in the coverage of things newsworthy, perhaps it was an attempt to head it off at the pass as the news service surely sees the writing on the wall and wanted to get ahead of the curve. The advent of the camera within the cell phone has made citizen journalists of us all. Remember the jet on the Hudson River in New York? iPhone photography was the coverage of choice for those witnessing the event and that coverage became the iconic image of the day. No newspaper was there at the time to record history as it happened, but well equipped ordinary citizens provided coverage on the scene. I appreciate your stand for content creators and their rights. Keep on keepin' on, John!